Food Costs > How Much Does Bacon Cost Per Pound? How Much Does Bacon Cost Per Pound? The cost of bacon will greatly depend on the brand, type, flavor, quantity, the market demands, and where you purchase it. With so many brands available at the local grocery store, the costs can tend to be all over the place, but on average, most 12 to 16-ounce packages, which are the most commonly found quantities at a local store, will range anywhere from $4 to $6. Your cheaper bacon brands will often be high in sodium and filled with additives, while a middle-of-the-road bacon will typically be immersion-cured bacon with some additives thrown in. The most expensive option, often dry cured, will be the center-cut portion often found at a butcher. NOTE: These were the average prices found at our local Walmart store and via other retailers. As for the price of freshly sliced bacon, often referred to as pork belly, found at either the meat department inside of a grocery store at the meat counter or at a local butcher will cost $5 to $8 per pound. The highest rated original bacon slabs on Amazon.com, for example, retails for close to $11 per pound. BaconPro keeps up with the retail price, showcasing the bacon price averages throughout the United States. At the time of this publishing in November of 2017, freshly sliced bacon averaged $4.84 per pound, whereas pre-cooked averaged $32.30 per pound. Again, as mentioned, these prices can vary depending on current market conditions. The Bureau of Labor Statistics also keeps tabs on the average prices of bacon per pound, with the average price per pound being $5.481 in September of 2016 and $6.366 in August of 2017. Commonly found flavors often include smoked bacon, which as the name implies, is a bacon that mimics a smoke-like flavor. Depending on the brand, the manufacturer may use liquid smoke to speed up the process of it may be smoked naturally with wood-smoked flavors such as apple wood or cherry wood. Aside from smoked flavors, bacon may also be spiced with flavorings such as brown sugar or even a Cajun spice, for instance. Additives to look out for, depending on the brand, may or may not include salt, nitrites or artificial flavorings. Just like flavors, bacon can come in three varying slice thicknesses, including the standard thickness, center-cut or thick-cut. The standard thickness, sliced roughly 1/16-inch thick are sliced into strips and is ideal for your standard pan frying. A center-cut, designed for those looking for a lower fat content, will be the meat that comes from the meat that’s closer to the bone, which, on average, contains 30 percent less fat. Lastly, a thick-cut bacon, often used for pasta or soups, measures 1/8 of an inch and can take twice as long to cook. Bacon will, most of the time, be uncooked, but some packages may be pre-cooked, only requiring it to be microwaved for up to one minutes. Popular bacon brands found in the local grocery store includes Oscar Mayer, Hormel, Farmland, Wright, Great Value (Walmart), Kirkland (Costco), Farmer Johns, Smithfield, Applegate, Wellshire, Trader Joe’s and Niman Ranch. At a butcher, they may refer to bacon as pork belly, but you may be wondering what the difference is between pork belly and bacon. 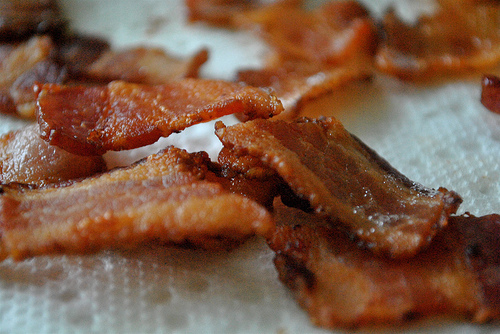 In essence, bacon is cured pork, which involves salt and sugar and is often a smoked product. As the pork belly cures, the moisture, as time goes on, will draw out the harmful bacterial growth, encouraging benign bacteria to grow, which creates an acidic-like environment. Pork belly will start from the underside of the pig, but not the belly, rather the flesh that runs underside the pig. In the end, pork belly is the uncured, un-smoked and un-sliced form of bacon. About 68 percent of bacon’s calories will come from fat, half of which is unsaturated fat. Two slices of bacon alone will have seven grams of fat and nearly 400 milligrams of sodium. Store-branded bacon will almost always be a competitor in a different packaging label, which means it will offer the same flavors and tastes for up to 30 percent less. Buying in bulk at either Costco or Sam’s Club can often bring the costs down by more than 20 percent. Most packages found at a local wholesale club will come in three-pound packages. Bacon is almost always on sale at a local supermarket. Be on the lookout for special promotions or even coupons from top brands.